In 1777, a certain Joseph Heely of Birmingham published a guide book to the three great West Midland gardens of the mid-18th century with a very long-winded title—Letters on the Beauties of Hagley, Envil and The Leasowes with critical remarks and Observations on the Modern Taste in Gardening. In the book Healey describes an incident where he was walking along the edge of a cliff when he was caught in a thunderstorm. Healey scanned the area for a shelter and noticed some smoke rising out of a cleft in the rocks. He hurried towards the direction and was pleasantly surprised to discover a couple of houses carved by the side of the mountain. Healey was cordially welcomed into one of the houses which he describes as “curious, warm and commodious”. He went on to describe how they were well furnished with plenty of provisions and had access to water. The inhabitants, he noted, were decent people who were proud of their houses and were happy to explain to him at length how they had labored to build them. This was the first written account of the Rock Houses of Kinver. More than a century later these same houses would inspire J. R. R. Tolkien to write one of the most beloved and delightful children’s tale, The Hobbits. 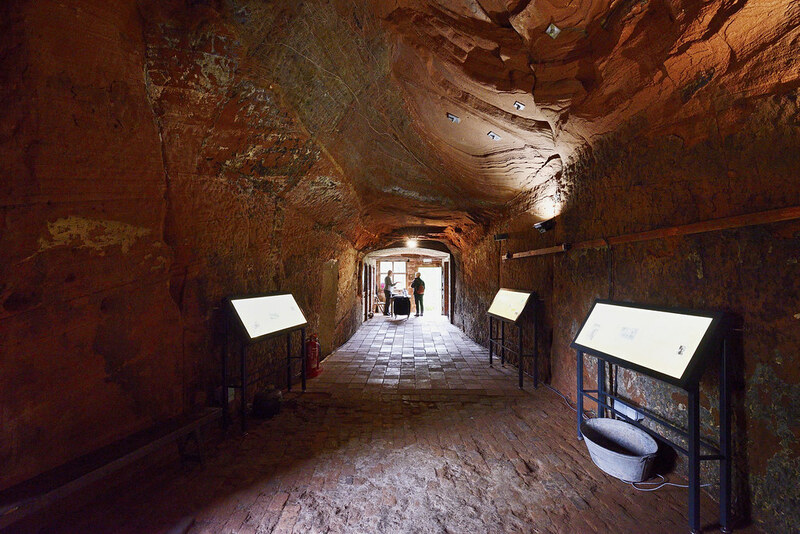 The massive sandstone escarpment just west of Kinver, on the border between Worcestershire and Staffordshire, in England, is punctured by numerous caves that served as dwellings as late as the 1960s. This soft Triassic-era stone is very easily quarried and natural caves can be quickly enlarged to form habitats. The houses are arranged in two necklaces around a knob of rock called the Holy Austin. There is no record of precisely why the rock is called so, but rumor is that an Augustine monk once had his hermitage here. Most of the houses have only two rooms—one for living in and one for sleeping, with a storeroom at the back. Each room had a fireplace cut into the rock, with a slanted chimney flue taking the smoke towards the outer wall. The houses even had electricity, and piped gas and water. Nobody knows exactly when the first caves were carved. But based on the ages of similar rock-cut chambers in the neighbouring county of Shropshire, it can be assumed the original rock homes in Kinver Edge were cut as early as 700 AD. After the Norman conquest of England in the 11th century, Kinver began to grow as a town because of the presence of farmland in the area, and due to its location on the main route from Bristol to Chester, which significantly increased its importance in the region. By the middle of the 17th century, some of the local people had taken to quarrying rock from the nearby cliffs. 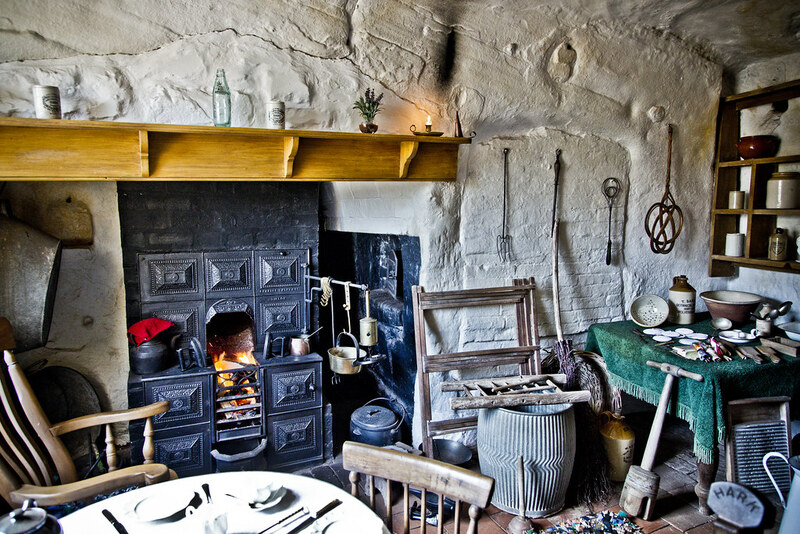 It is possible that the first permanent inhabitants of the Rock Houses were the descendants of the local quarrymen. A survey carried out in 1830 found six families living in the cave houses. At its peak, the complex housed eleven families. …which wasn’t too different from what Healey must have seen when he took shelter in one of the houses during the thunderstorm. Certain stories and legend surrounding the Kinver’s rock houses also seem to have been adapted into Tolkien’s novel. There is a story that once a terrible fight broke out between the giants of Kinver (who lived in the hills) and those of Enville over a pretty giantess, resulting in the Enville giant from being driven out of Kinver. To remind him never to come back the Kinver giant threw a great boulder after him which landed near the village of Compton. Another version of the legend is that the Enville giant was struck by lightning while the sun was still shining and turned to stone. There are unmistakable parallels to these stories in Tolkien’s novel The Hobbit. In chapter II, Roast Mutton, Bilbo Baggins and his companions are trapped by three unpleasant trolls, or giants, who are tricked into arguing until dawn when the sunlight turns them to stone. Later in the story they must hide in a cave during a storm to avoid rocks that are being thrown around by mountain giants. While Tolkien never revealed the names of the places that inspired his stories, he did admit that many of them were based on his experiences in the English Midlands where he lived as a youth. Kinver is situated less than 20 miles from Birmingham where Tolkien lived, and at that time it was a popular day out from the city. Tolkien is also noted to have hated living inside the City of Birmingham and took every opportunity to explore the surrounding countryside. 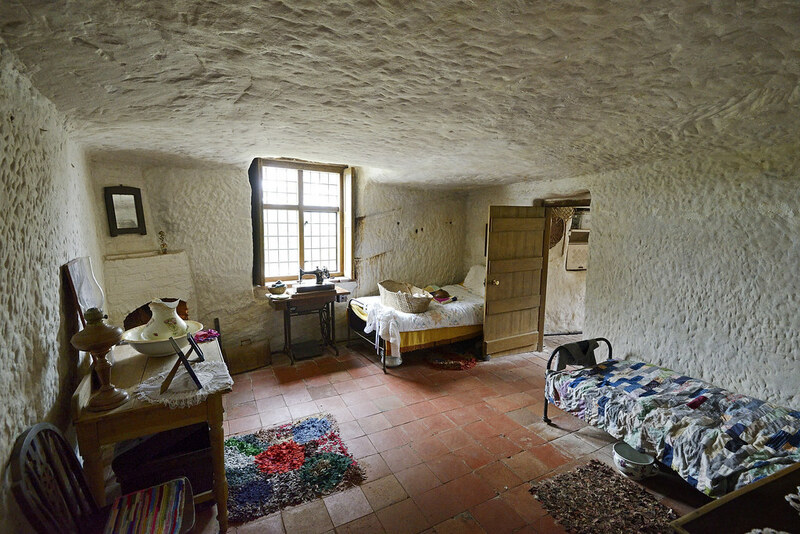 It is possible that Tolkien visited Kinver’s rock houses or read about these remarkable dwellings. The last families to have lived in the Rock Houses moved out in the 1960s. After that vandals took away whatever that was of value, including doors and wooden window frames. In the 1990s, the site was purchased by the National Trust and some of the houses have been restored to their original condition for visitors.